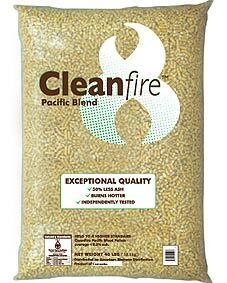 Cleanfire™ Pacific pellets are known for their high heat and low ash content. Not only are they tested at the mill to ensure super-low ash and high BTU, but they’re also certified through independent third-party labs to ensure the highest quality. Cleanfire™ Pacific pellets are sourced from the Western forests of North America, and include material recycled from standing deadwood. Ash residue ranges from 0.3% - 0.5%, which means CleanFire™ Pacific pellets meet the PFI super-premium ranking for ash content, and the heat output typically ranges from 8200 – 8400 BTU/pound.